I am not generally a fan of dairy, or rather, dairy is not a fan of mine. However, as the years tick by on a strict gluten-free eating plan, my intestines have begun to welcome a select few dairy items without distress. 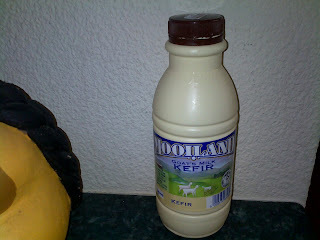 Enter my new favourite: Goat's milk kefir. This unique and tasty gem is brought to us by Mooiland (South Africa), and is available from a few Super Spar outlets for R12.95. Now, onto my hubby's favourite bovine product: Bulgarian yoghurt. Mention yoghurt and my DH's eyes light up with childhood tales of giant buckets of milk bought fresh from Irene Dairy by his Bulgarian father; cultured to make homemade yoghurt; and mixed with olive oil, garlic and cucumber (no less). Thus, I like to keep my eyes pealed for different incarnations of this breed of yoghurt. And voila! 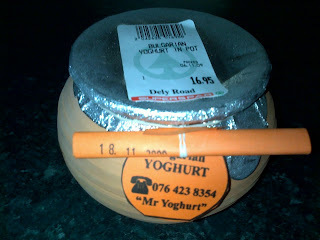 This cutesy presented itself to me the other day in a charming little terracotta pot from Mr Yoghurt (South Africa), also available from select Super Spar stores for R16.95. For a tasty gluten-free treat: slice in some bananas, stir in some honey and sprinkle over some almond nibs. We love kefir too. I keep meaning to get some grains and do my own, but in the meantime when we find goat's milk kefir, we like to shake it up with honey and vanilla or a dash of cinnamon and slurp it down. The banana mix sounds just like my breakfast - so decadent! Making one's own kefir sounds like such an interesting project. I love how it becomes self-sustaining in terms of its re-usability. I buy Mooiland Kefir in Pretoria from the Monument Park Super Spar.